CNG: Printed Auction CNG 64. 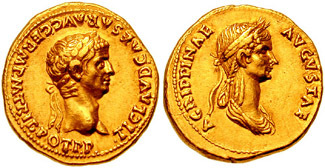 CLAUDIUS, with AGRIPPINA, Jr. 41-54 BC. AV Aureus (7.69 gm). Rome mint. Struck circa 42 AD. Sale: CNG 64, Lot: 983. Estimate $15000. Closing Date: Wednesday, 24 September 2003.